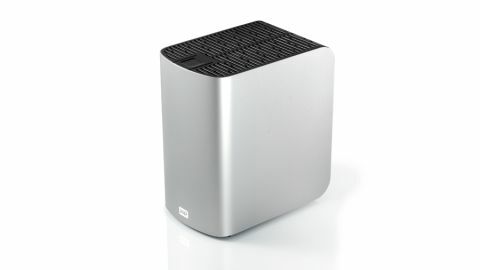 The My Book Thunderbolt Duo is Western Digital's first desktop drive to use an ultra-fast Thunderbolt interface. In fact, it has two such ports, so the drive and an external display can be connected to a Mac with just one by daisy-chaining the display from the drive. There are two disks inside, and WD has improved the marking and releasing of the mechanism that lets you in, should a disk need replacing. They're configured as a striped array by default, for the full capacity of 4TB in a single volume, with the risk that everything is lost if one disk expires. However, it has tremendous speed benefits. With files of 2MB and larger, it averaged 298.4MB/second when reading, and 266.1MB/second when writing, but with large variation in write speeds, between 353.1MB/second down to a low of 217.2MB/second. Fortunately, the supplied software enables you to easily reconfigure the hard disks as a mirrored array, halving the usable capacity and slowing transfer rates, but with the insurance of having two copies of your data. In this mode, read speeds averaged 189.1MB/second, and 126.4MB when writing. We found less variation in write speed in this mode. It peaked at 176.8MB/second, and hit a low of 111.7MB/second with a 100MB file. The Thunderbolt Duo delivers speeds in excess of the equivalent FireWire 800-equipped Studio II drive, and it can be bought for £400, which isn't a huge premium. However, its performance is inconsistent compared to some other Thunderbolt RAID arrays, such as LaCie's Little Big Disk Thunderbolt Series 240GB SSD, which are a better option when sustained high speed is essential.